Why Are People So Obsessed With New Football Kits? Despite the fact that kit launches are little more than PR stunts and the strips themselves are increasingly generic, the circus which surrounds the arrival of new kits still thrives. Why are we still interested? 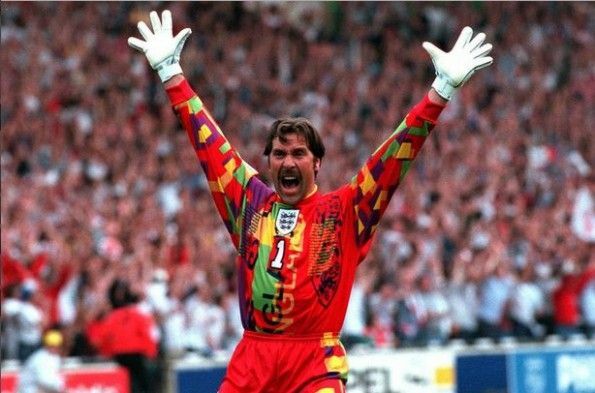 As far as football kits are concerned, we've come a long way since the experimental zenith of the nineties. That was the decade which gave us the mesmeric chevrons of Arsenal's 1991-1993 second kit, the ice-blue maple leaves of Manchester United's 1990-1992 away number, and the intersecting rectangular madness of England's greatest ever goalkeeping strip, which looked like the opening credits to Newsround filtered through an intense PCP trip and fitted loosely to David Seaman's flesh. Now, there is little such experimentation, with manufacturers seemingly averse to risk in what has become an enormous global industry. With markets for new kits having expanded massively since the nineties, eccentric designs appear to have been jettisoned in the name of safeguarding profits, with a fear of controversy and customer backlash surely a major factor in the standardisation of strips. The conservative approach taken by manufacturers may well be encouraged by social media, with leaked kits now greeted with an immediate wave of acclaim or censure which no doubt decides whether or not they make it to shelves. Twitter and Facebook provide free market research in a sense, but also contribute to a culture where immediacy is everything. 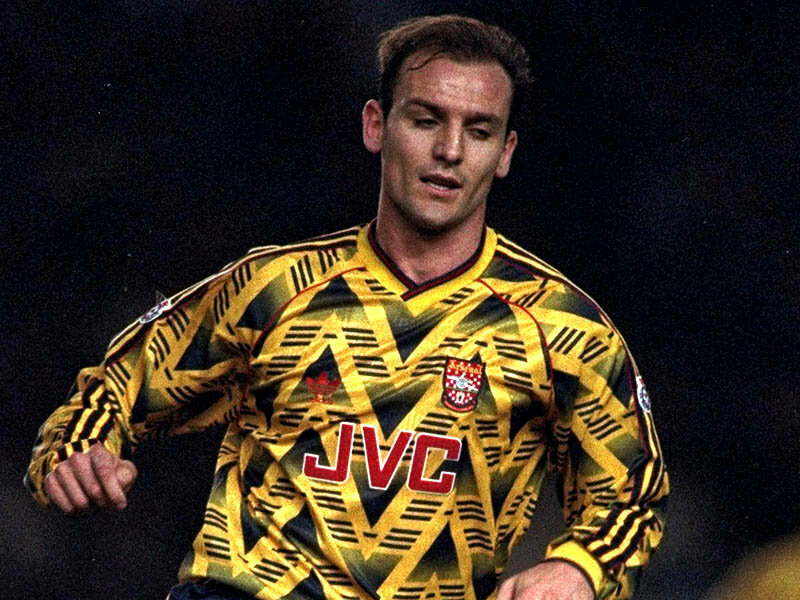 It's hard to imagine a shirt featuring yellow and black chevrons passing the social media threshold these days, but that Arsenal kit is now widely considered to be one of the club's most iconic and remains remarkably popular. It would have caused an absolute shitstorm on Twitter had verified accounts and viral banter existed in the nineties, and may well have been quietly discarded in the aftermath. The world would have lost a kit which has now transcended football and inspired tributes in the world of fashion, and which is spotted at raves, club nights and festivals almost as often as it is at Arsenal games. Considering the numbers involved in the kit industry, it's perhaps understandable that manufacturers are unwilling to gamble on designs which are successful in the long term but contentious at launch. According to the Manchester Evening News, Manchester United topped the annual shirt sales table for 2016 after shifting around 2,850,000 units, many off the back of them signing Paul Pogba and Zlatan Ibrahimovic. With the cheapest version of last season's home shirt priced at £60, this is equivalent to profits in the high tens of millions at the very least, and neither the club nor manufacturers Adidas are going to risk diminishing revenues for the sake of avant-garde aesthetics. Then there is the sheer quantity of kits to think about, with Premier League clubs long ago disregarding a pledge to limit the number of strips they release and ensure greater longevity. There are only so many traditional designs a manufacturer can use, and so they find themselves more and more reliant on templates to design new home, away and third kits every year. The result of all this is that kits are increasingly homogenous, with manufacturers making at most incremental changes ahead of the new season. Nike have come in for particular criticism for their unimaginative use of templates, with many of their international kits impossible to distinguish from each other on any criteria other than the badge. The reliance on templates is not a new phenomenon and has been noticeable since the early noughties, but the number of strips being released has made it even more obvious in recent times. Kit launches – much like the kits themselves – have been devalued by their ubiquity, and now tend to be little more than transparent PR exercises. So with designs so formulaic and industry events similarly uninspiring, why are people still so obsessed with new kits? Despite complaints about generic designs and high prices being commonplace at this point, the circus which surrounds the arrival of new kits seems to be thriving unabated. Most of the major media outlets are running 'confirmed kits' live blogs and articles, while there has been a steady trickle of leaked shirts – both real and fake – since the summer transfer window began. New kits are often tied in with transfer news, which is perhaps the key to maintaining the hype around leaks and official launches. Some have attempted to find clues to transfer business hidden away in photoshoots and modelling sessions, with conventional wisdom dictating that a player cannot move clubs after appearing in promotional material for a new strip. There is little merit to this idea in reality, with kit launches generally taking place well before the majority of summer moves are finalised – not that a team would ditch a multimillion-pound transfer on account of having to replace the cutouts in the club shop. Just as with the majority of transfer rumours, new kits also benefit from the craving for a football substitute over the summer months. One of the many reasons that the summer window draws more interest than its January counterpart is that there are fewer distractions, with rolling transfer news acting as a surrogate for matchday and the deluge of commentary and reaction which follows. While the first few weeks of the summer come as a relief after the dramatic denouement of the previous campaign, the true football addicts among us start to suffer withdrawal symptoms not long afterwards, itching and becoming restless even when there is an international tournament to watch in the meantime. Much like following ITK Twitter accounts and keeping up with indiscriminate gossip round-ups, kit releases act as a transient release, a football hit which can be boiled down and injected directly into the veins so long as we don't think about it too much. There is an element to which new kits are a guilty pleasure, then, an addiction which gives us diminishing returns but serves as a form of escapism nonetheless. They might disappoint us more often than not these days, but the desire to view leaked images of kits and indulge their small tweaks and changes still remains. The glory days of the nineties may be over, but there is still a residual excitement when it comes to seeing what template a team will wear this season, which perhaps says something about the hopelessness of being a football fan and the ease with which corporations and manufacturers exploit our loyalties. The difference now is that, unlike the inventive and unconventional kits of the nineties, it's unlikely there will be many supporters who seek out their 2017-18 strip in over two decades.